Let them eat cake (wedding cake that is!). - Stop staring and start sewing! Let them eat cake (wedding cake that is!). I'm finally finished!! I've made a flower girl's dress that would make Marie Antoinette green with envy and 2 dainty (yet sophisticated!) 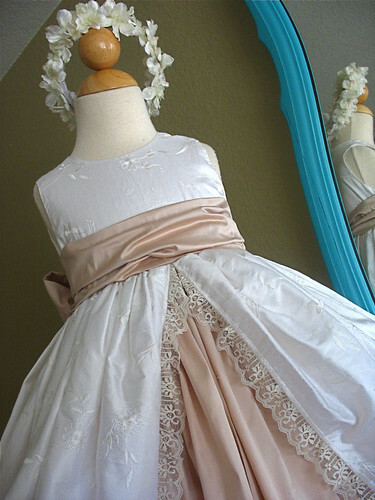 little junior bridesmaid's dresses! I've made/altered countless bridesmaids's dresses for the bride during her teen years so it's a thrill to get to sew for her wedding (which is only two days away!). 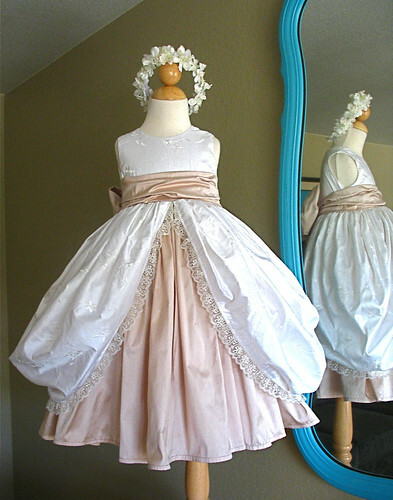 Here's the flower girl's dress. I used Simplicity 8953 for the skirt but used another pattern for the bodice. The pattern is sized 4-8 but the flower girl measures between a 2T - 3T so I needed to decrease everything down to size teeny (my brain is hurting from all the math I've had to do in the last week!). I even did the headband! I picked up a little headband at the dollar store and then hot glued the white fabric onto it. I tried making my own rosettes but I wasn't happy with the outcome so I ran up to Michael's for some silk flowers. I hot glued everything in place and taught my kids a few new words every time I burned myself (I really want to kill that glue gun). But I think it's gorgeous so "no pain, no gain", right? Here's the big, fat sash in the back. Lovely. I took these pictures then called the flower girl's mom to come get it. I wanted to say "Hi, I'm done with the dress. Now please come get it before my cat barfs on it or the two year old takes the crayons too it!". She's coming in the morning so I'm guarding it until then. 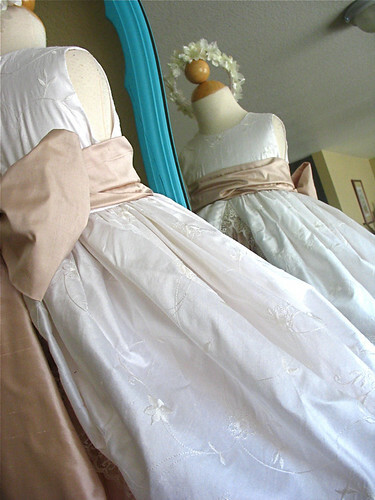 I just finished the junior bridesmaid's dresses about an hour ago and I'm breathing a huge sigh of relief. I've sewn for 3 weddings in the last 3 months and it's been a joy but I'm happy to be done for now. I used New Look 6749 for this one but had to completely re-work the pattern to fit these little (and I mean little) gals. 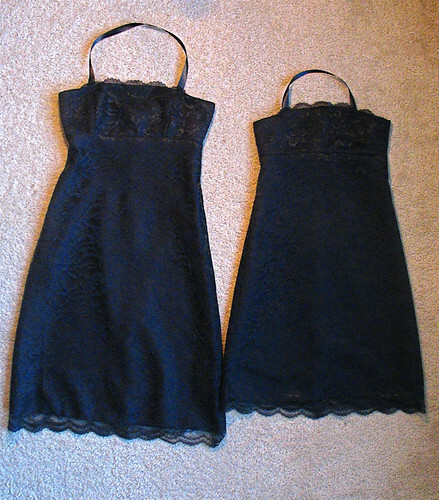 The short dress on the right is 27 inches from top to bottom just to give you an idea of how small I had to go. It was like making a Barbie dress. Here's a close-up of the bodice. Those scallops took a lot of work to get them even and I really don't like sewing black on black with black thread. Everything just blends in and it's hard to see where one layer ends and the other begins. I used my cute little granny glasses to see real close (they kind of look like Dame Edna glasses with the little rhinestones!). 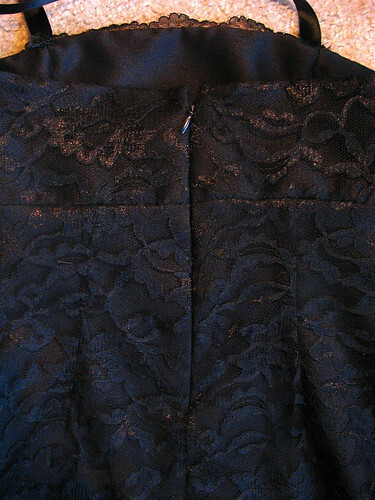 Oh but I got to use my walking foot to sew the lace layer onto the crepe fabric and it was wonderful! I'm going to show you the invisible zipper because I'm so proud of it and I don't anticipate anyone coming up to me at the wedding and gushing "Oh my gosh! That invisible zipper is absolutely sublime!". But I figured anyone who's ever attempted one will appreciate this. Sublime, right? I use this great tutorial for installing invisible zippers and I love it. I've used it for a few years now and keep a copy of it pinned to the wall above my sewing machine. If you've never tried an invisible zipper this will really help out and you'll be kicking yourself for waiting so long. In other new, it looks like David Walker's Robots fabric is starting to ship out so you can run over to the Free Spirit site and take a peek at all the great prints! I will have it loaded in the store and ready to go the second that cute UPS guy gets here. I really think people are going to go nuts for this fabric! And I've started a Facebook page for all of us who want to join together to help save Mary Engelbreit's Home Companion magazine. Maybe if enough of us raise a fuss, throw a tantrum, whatever...they'll hear us. So please join and spread the word! I'm going to go put my feet up now. Go try that invisible zipper!